I know, it’s been a long time since our last post. I’m still alive, still getting all sorts of submissions. Some day we’ll get through our backlog of awesome nerdy tattoos. But this one came in the other day and I just had to post it, you know since the new Star Trek movie, “Into Darkness” just came out. It took me a while to figure out what kind of Star Trek tattoo I wanted to get. I finally decided that the enterprise d on my knuckles was the best choice for me. It’s still a work in progress there will be more shading and colors after the initial outline heals. let me know what you think of them so far. That’s right, boldly going where no knuckle tattoo has gone before. 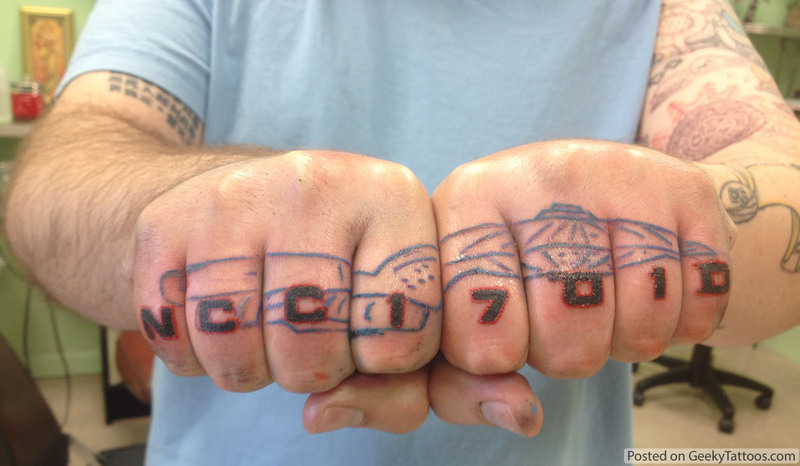 Tagged with Enterprise, knuckle tattoo, knuckles, NCC-1701D, Star Trek. “@geekytattoos: The Best Starship Enterprise Knuckle Tattoo: http://t.co/ssG4I3gx64” I NEED THIS. @cyrusam on Design Her Tattoo! @cathycorn on Design Her Tattoo! @Suggested Browsing on Who Is Atlas? @danielaj on Design Her Tattoo!